MyWay Genetics is an innovative italian startup specialized in designing of personalized medicine services based on genetic testing. The company takes care of transferring solutions from the genetic research world to the healthcare market, working with important companies and specialists. 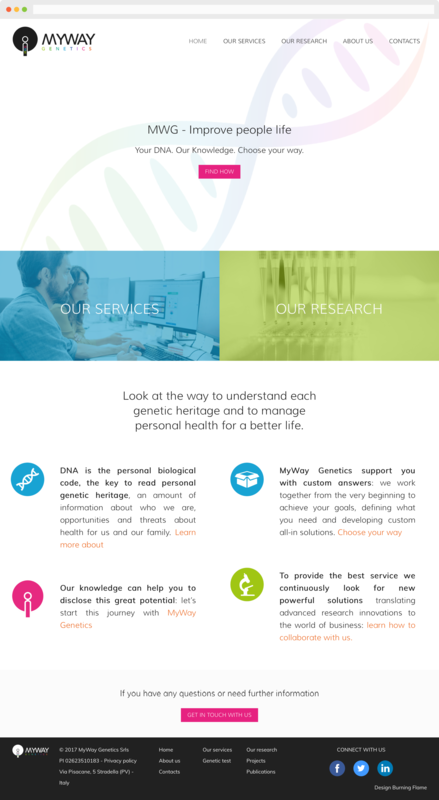 Burning Flame has supported MyWay Genetics in developing the new website, with the aim of promoting the services design and medical research activities. The first phase of our project consisted in redefining the logo, studying a new colors palette, and creating a set of icons, closely related to the textual content created for the website. Next, we focused on the graphical interface, designed with a particular attention to the mobile layout. The website has been developed on a WordPress platform, ensuring excellent editorial content management through the customization of the CMS (Content Management System). We finally performed an accurate search engines optimization of pages and contents.